U.S. News and Best Lawyers released the 2018 “Best Law Firms” rankings today. Miller Johnson received tier one rankings for 26 practice areas in the Grand Rapids Metro Area and 9 in Kalamazoo. This is an increase for both offices. For the services we provide to individual clients, the firm received tier one rankings for Family Law (including Mediation) and Trusts and Estates (including litigation). 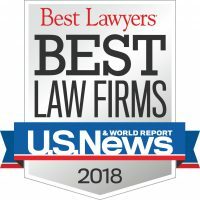 The rankings in the 2018 Edition of U.S. News – Best Lawyers “Best Law Firms” are based on a rigorous evaluation process that includes the collection of client and lawyer evaluations, peer review from leading attorneys in their field, and review of additional information provided in the law firm survey. All of the quantitative and qualitative data were combined into an overall “Best Law Firms” score for each firm then compared to other firms within the same metropolitan area and at the national level.